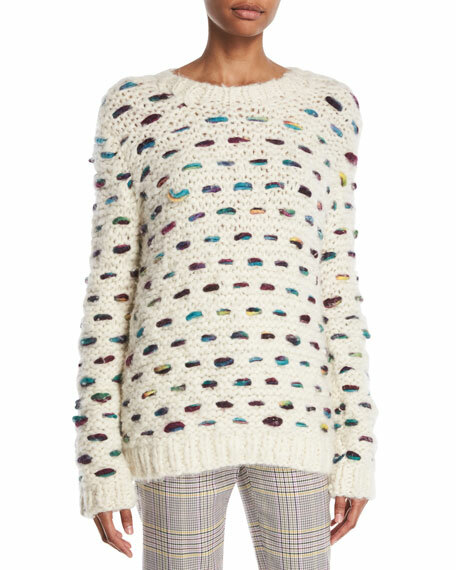 Simone Rocha extrafine knit patchwork sweater with beaded details. For in-store inquiries, use sku #2663864. 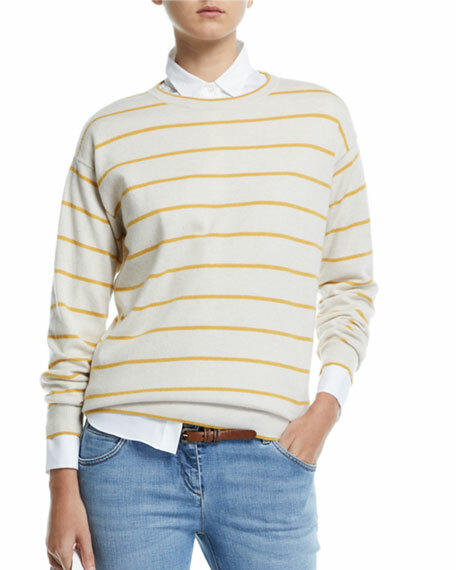 Brunello Cucinelli sweater in striped wool-cashmere knit. Crew neckline. Long sleeves. Relaxed fit. Ribbed hem and cuffs. Pullover style. Virgin wool/cashmere/silk. Made in Italy. Model's measurements: Height 5'11"/180cm, bust 32"/81cm, waist 25"/64cm, hips 36"/91cm, dress size US 2/4. 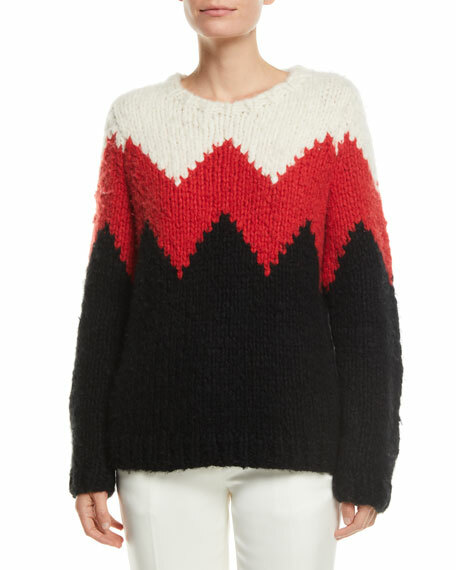 Gabriela Hearst fluff sweater in zigzag cashmere. Crew neckline. Long sleeves. Relaxed fit. Pullover style. Imported. Model's measurements: Height 5'10"/177cm, bust 33"/84cm, waist 25.6"/65.2cm, hips 35.8"/91cm, dress size US 2-4/FR 34-36. 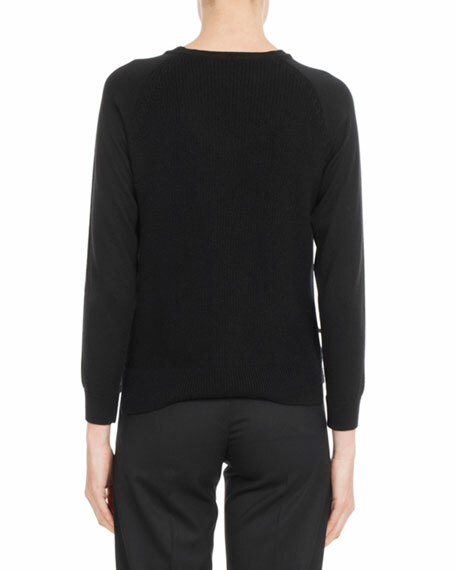 Gabriela Hearst "Marello" cable-knit sweater. Crew neckline. Long sleeves. Relaxed fit. Pullover style. Cashmere/wool. Made in Italy. Model's measurements: Height 5'10"/177cm, bust 32"/81cm, waist 24"/61cm, hips 35"88cm, dress size US 2/4. 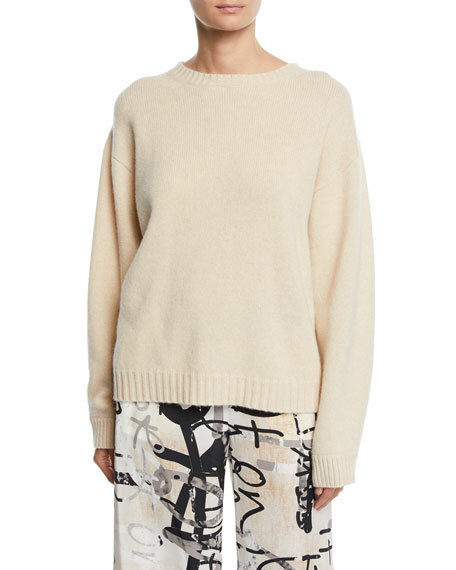 Maxmara "Onda" sweater in cashmere. Crew neckline. Long sleeves; dropped shoulders. Relaxed fit. Pullover style. Cashmere. Imported. Model's measurements: Height 5'11"/180cm, bust 32"/81cm, waist 24"/61cm, hips 35"/89cm, dress size US 2.